A Podiatrist Can Treat My Broken Foot? YES! No one plans to break their foot. It just happens. You can twist the wrong way playing a sport, step into a hole in the parking lot, or trip and fall. Foot fractures are unique in that you have to bear weight on your foot after it heals. For that reason, it is crucial to have your foot evaluated and treated. In Houston, TX, a podiatrist is uniquely suited to handle this all in the office...no waiting in the ER! A fracture is a break in the bone, which is caused by trauma. The foot or ankle will appear bruised and swollen and will likely be very painful. 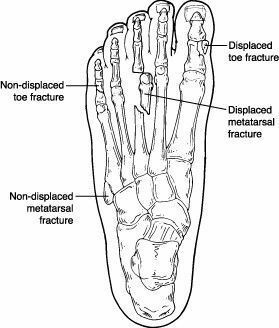 A fracture is often not displaced and may be simply treated by immobilizing the foot, ankle, and leg to allow the bone to heal. There are times where the fracture is more severe and will need to be corrected surgically. A stress fracture is not caused by a particular trauma but rather a continuous repetitive stress. This type of fracture is often seen in athletes and “weekend warriors.” A stress fracture, however, can happen to anyone. It does not present with bruising, but rather with a moderate amount of swelling. The pain is not severe, but can often be described as a bad ache. It is important to have a stress fracture immobilized to allow the bone to heal, recover, and return to full strength. Once healed, we use orthotics to manage the pressure and stress on the bone which will prevent a reoccurrence of the fracture.